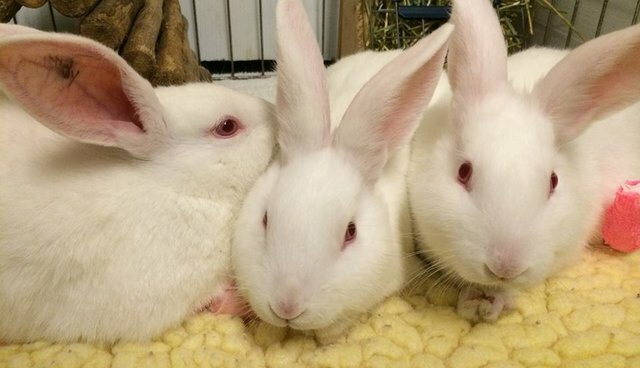 A group of injured baby rabbits who were listed for sale on Craigslist as "imperfect snake food" are on the road to recovery, thanks to a group of rescues that stepped in to save them. Their story shines light on the inhumane conditions many rabbits face in breeding facilities, where they're viewed as little more than lifeless "products" designed for human or animal food. 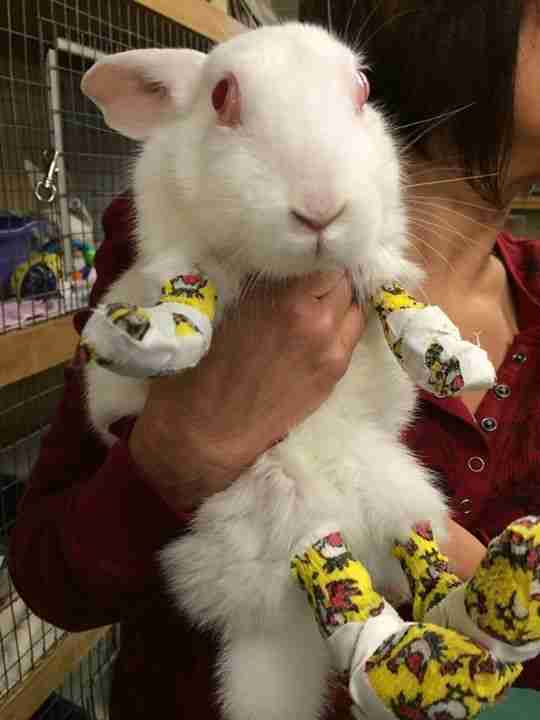 "It was pretty horrible," SaveABunny founder Marcy Schaaf told The Dodo. "It's like factory farming for rabbits." Janet Foster at Second Chance Bunnies found the 21 rabbits, who were at a small farm in Sacramento, and rescued them late last year. Schaaf's organization took in some of the most injured ones and has been helping to organize fundraising, while rabbit rescues Zooh Corner and PetSave took in others. 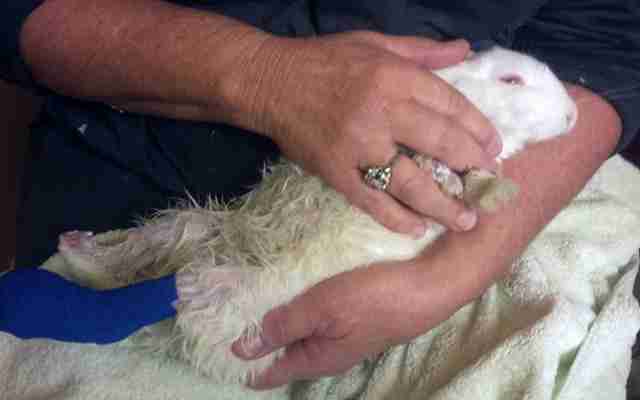 The House Rabbit Society also stepped in with an emergency grant toward the animals' medical costs. "The rabbits were packed in the typical kind of rabbit meat cages where there's wire flooring [which is dangerous to rabbits] and no rest area," Schaaf explained. "They're exposed to all the elements. There's no hiding." 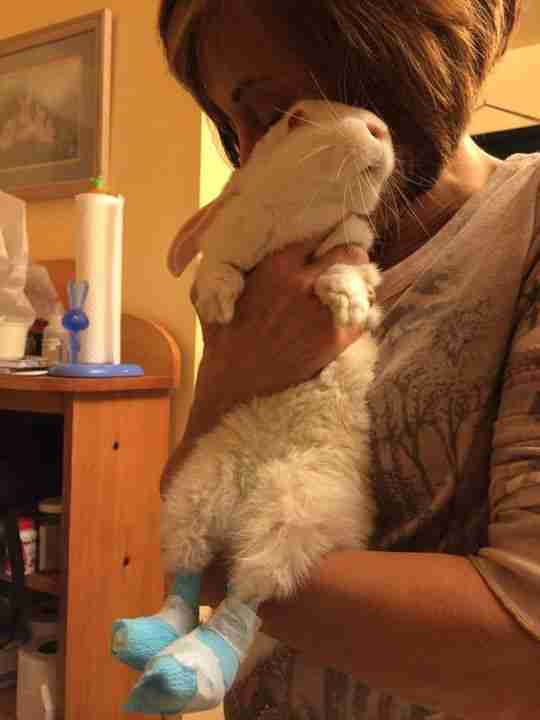 Even worse, many of the baby rabbits, including the 7-week-old New Zealand rabbits that SaveABunny took in, had been attacked by a loose dog who chewed off their toes and parts of their feet through the wire flooring. 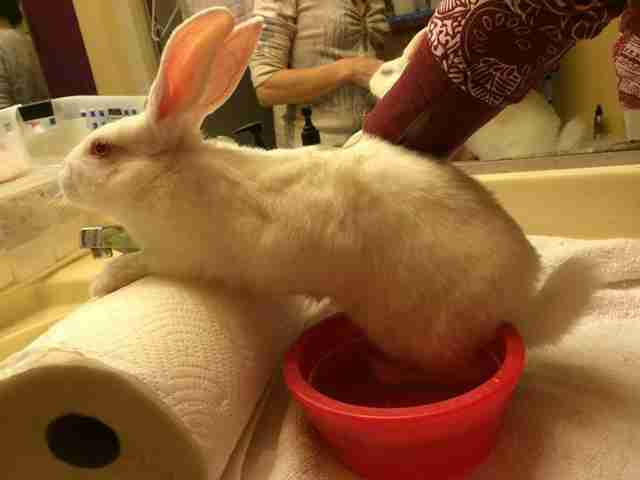 Still, the breeder was intent on making a profit, and listed the rabbits on Craigslist at a discount. Schaaf said that removing the animals from their situation was difficult, as the breeder was "very secretive and very sneaky" and reluctant to let anyone see his farming setup, traits common to rabbit meat breeders. 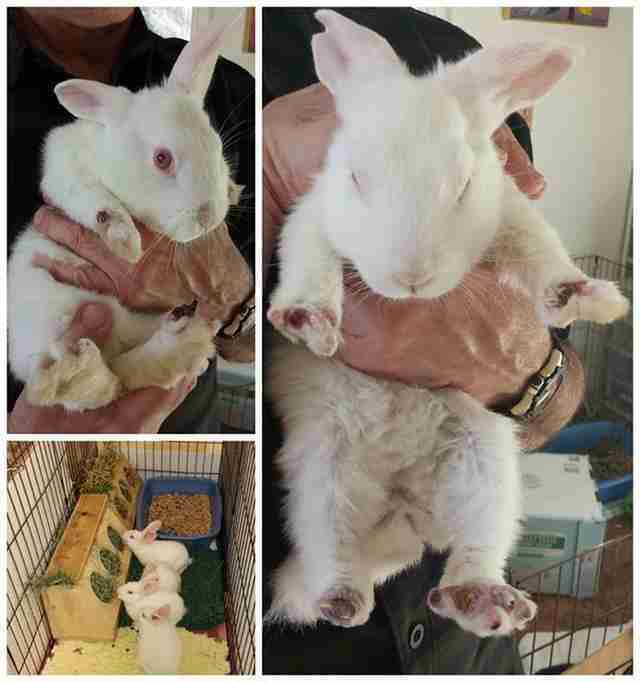 In one rescue last year, she explained, rescuers had to pretend to be potential buyers from an organic rabbit meat farm in order to access the rabbits. 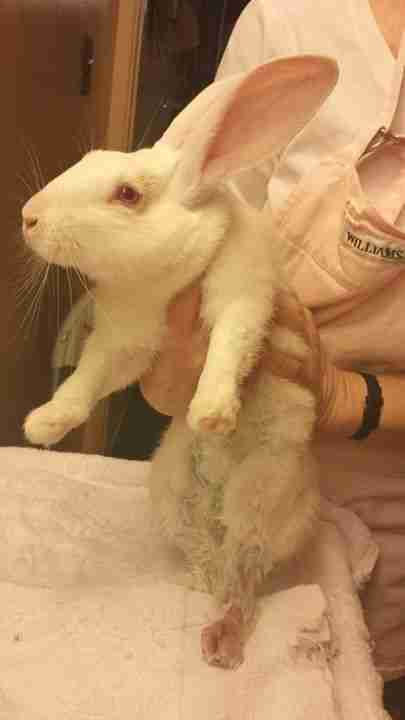 In this most recent rescue, a representative from Second Chance Bunnies called the breeder pretending they were looking for "snake food" in response to the ad. 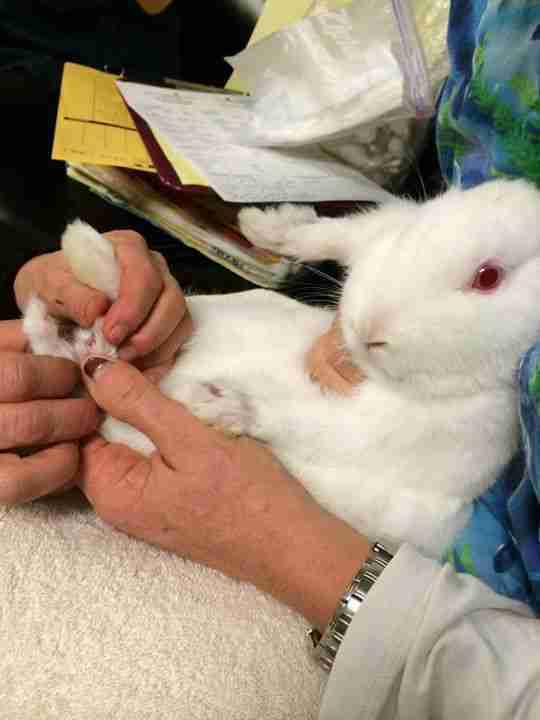 SaveABunny, like most rescue groups, is against paying breeders for animals, but they made an exception in this case because the rabbits had such serious, life-threatening injuries that never would have been treated otherwise. Part of the danger, Schaaf said, is that many breeders are "violently anti-rescue" and will kill rabbits rather than turn them over to rescue groups. "If they know you're from a rescue, they don't hesitate to say, 'Well, we're going to kill them right in front of you,'" she explained, adding that such breeders view rabbits only as products instead of living animals. This view isn't unique to meat breeders and has created challenges for rabbit rescue groups even within the animal rescue community. Part of the reason is that there's an arbitrary line drawn between "livestock" rabbits and pet rabbits, when they're really the same animals. "Nobody would say, well, this is a meat golden retriever and this is a pet golden retriever," Schaaf said. "People just think this is a normal part of meat production ... but no animal should have to go through that." The good news, however, is that the rescued rabbits have a much kinder fate ahead of them than others born into the meat industry. Zooh Corner founder Cat Logsdon told The Dodo that "things are looking better" for the four boys she took in, though at least one of them could need another procedure. 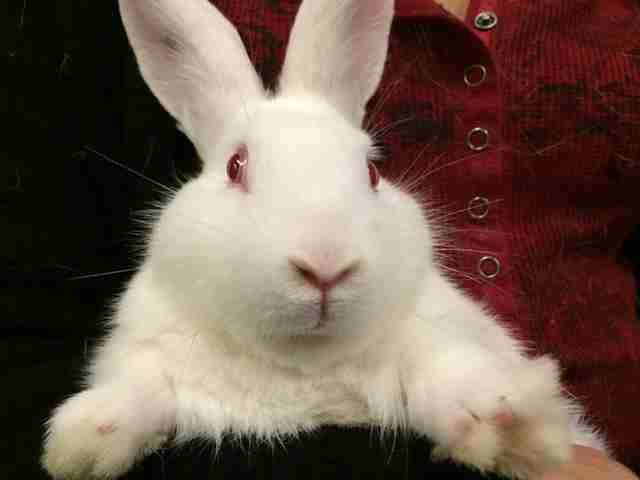 Of the eight rabbits SaveABunny took in, including a bonded pair of Flemish giants, three have already been adopted. The other four were just cleared for adoption. The last one, Rudy, was the most seriously injured with bite wounds to all four of his feet. He'll stay at the rescue a bit longer as he fights off an infection. "We're actually surprised he survived," Schaaf said, adding that he has a "very guarded prognosis." But the trauma he's experienced hasn't impacted his attitude. 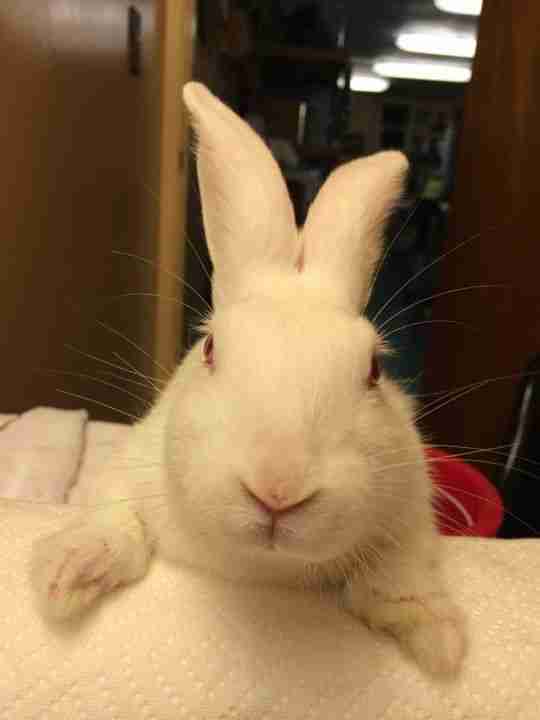 "He's an unbelievably sweet and patient rabbit. He's very, very special," Schaaf explained. "It's very painful for these guys, and the fact that they have been able to be loved and snuggled, and are willing to be with people after what they've been through, is really incredible," she added. "I can't imagine a human being as forgiving." If you're interested in finding out more about the rabbits featured in this article, visit saveabunny.org. Clarification: This piece has been updated to include details about Zooh Corner and PetSave's involvement.